The muscle car war continues. Dodge is having an awful lot of fun these days basking in the publicity of is new Challenger SRT Demon, but cross-town rival Ford isn’t about to let Dodge enjoy the spotlight all by itself. Just to make it absolutely clear to everyone, Ford has just announced that its GT350 and GT350R will return for the 2018 model year unchanged. There will be, however, three new paint colors: Orange Fury, Kona Blue and Lead Foot Gray. Pricing has yet to be announced, but we can’t imagine it’ll be all that different from 2017, with the GT350 starting at $57,045 and the GT350R at $65,545. The naturally aspirated 5.2-liter V8 with 526 hp and 429 lb-ft of torque will remain standard as will the six-piston Brembo brake calipers and MagneRide damping system. SYNC3 will be optional, as part of the Electronics Package. Ford also says that a new Convenience Package for the GT350 will replace the Recaro manual seats with six-way power, heated and cooled sport seats with Miko suede inserts for both the passenger and driver. Essentially, just minor packaging and color changes. 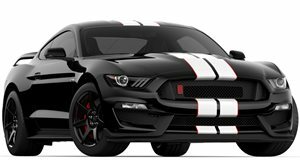 However, many of you may recall a group of GT350 owners who recently filed a class-action seeking lawsuit against Ford, claiming the car can lose speed and power mid-drive in as little as 15 minutes when taken to the track. These owners supposedly feel conned because the Shelby GT350 is being advertised as a track-capable road car, and they’re experiencing problems. This only affects 2016 models, as the suit claims Ford fixed the issue for 2017. Nevertheless, there’s still life left for the Shelby GT350 and GT350R.